Which are the easiest and hardest languages to master? For most people, mastering another language is no easy feat. However, it is broadly accepted that some languages are easier to learn than others. It’s a topic that is discussed often and in depth within the translation services industry, as well as by everyone from military personnel to expats. As such, let’s take a look at contenders for the easiest language to master… and the hardest! 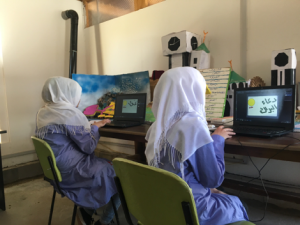 Fiona Reay, head of Client Services at FutureLearn, recently travelled to Lebanon to see the impact of technology at schools educating Syrian refugees as part of the Partnership for Digital Learning and Increased Access project, which has five years’ funding through the Strategic Partnerships for Higher Education Innovation and Reform initiative. Here, Reay discusses what she learned during the visit and some of the challenges that are yet to be overcome. I saw first-hand the innovative delivery of education in Lebanese communities from the American University of Beirut and listened to Syrian students and teachers about the impact of the PADILEIA project at the GHATA schools in the Bekka Valley. I was very impressed at the rapid pace that new schools have been rolled out in the Bekka region to accommodate 1.5 million Syrian refugees who’ve arrived in Lebanon; not only the infrastructure which has been put in place but the care which has gone into the meal planning and the welcoming environment from the teaching and support staff. These schools are happy places with enthusiastic teachers and grateful children and teenagers, a space of ‘normality’ compared to day-to-day life in camps or other temporary accommodation, and a chance for young people to be with their friends and have routine back in their lives. But there are several challenges to gaining an education when being displaced. While I experienced a positive and inclusive environment, there are still hurdles to overcome. Articulating your level of education is tricky if you move country, let alone if you haven’t brought proof of learning. The Syrian, Jordanian and Lebanese certification levels don’t all align, and I heard examples of students travelling back into Syria to sit the exams needed to move onto the next level of study. Stipends are often required to pay for travel costs and study expenses for Syrian and other disadvantaged youth. At the World Food Program school teachers reward participation with digital card ‘points’ that can be used in neighbourhood shops (much like vouchers), and this also helps stimulate the local Lebanese economy. Funding and scholarship application forms can be daunting for most and understanding the nuances of “pitching yourself” requires guidance from people who have done it before. Learning how to answer what extracurricular activities you do, and the value you can add to your community (when you’ve had to relocate due to civil war) can feel even more of a stretch. The PADILEIA students have found it really valuable to learn from mentors who can support them through this process and help them fill in the forms. I also witnessed a strong appetite for digital skills and discussion. PADILEIA’s aim is to increase critical-thinking skills so young people can prepare for higher education and consider wider career options like science, law, journalism, or IT. The first year of the project has a focus on mixing practical digital skills with learning English, as part of a Foundation Certificate to build readiness for further education. These transferable skills build the confidence of young people. Students also learn Microsoft and Google Drive programs, as well as AutoCAD software for potential engineering and architecture pathways in the future. There also exists a supported and blended approach to online learning. A lot of mentoring is required around goal setting, and coaching on time management is constantly needed – these are teenagers with homework after all! Passionate teacher Mahmoud Shabaan, Students Service Coordinator at the GHATA School, provides mentorship support seven days a week, uses WhatsApp and Facebook groups to connect students after hours. 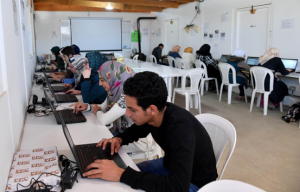 The school also invites Syrian scholarship awardees at the American University of Beirut to deliver “do your homework pep talks” to keep students motivated, and they plan to use graduates of the PADILEIA program to help train and support the next cohort of students. Houssam, who has just completed his Foundation Certificate from the American University of Beirut (AUB), delivered an inspirational speech to the PADILEIA visitors, explaining the benefits he was seeing from studying with mentors and the goals he has for the future, including scholarships for higher education. The teachers in Bekka also explained that using online resources to date has been a challenge, due to the students’ level of English but also connection issues and that they’re aiming to use more online tools in the classroom as their experience with using technology for learning increases. It will be interesting to see how young people and their educators will embrace online and social learning. To help with this, new online free basic English courses designed for the Middle East have been developed. Two new courses teaching Basic English from King’s College London, at elementary and pre-intermediate levels, have been specially created for Middle Eastern learners. The short courses tell the stories of local characters Samir, Maya and Amena who learn practical phrases and hear from British voices. They include Arabic transcripts and are prepared for students learning in an environment with power cuts and slower wifi, meaning a stronger focus on audio (rather than video) and low bandwidth optimised files. Online facilitators from King’s College London have been specially trained to help support Middle Eastern learners. The King’s College London courses are available on FutureLearn.com with free continued access for all, funded by the PADILEIA program. As reported in The PIE News, LanLearn, an English language school located in Ireland recently closed its doors affecting approximately 150 International students. The closure followed an inspection in January by the Department of Justice and Equality where a number of irregularities were discovered. A school closure is inevitably very distressing for students who may be unaware of their rights in such circumstances. One Brazilian student affected by the closure had paid almost €6,000 for both herself and her son for a six-month course which she thought she had lost. The computerization of the TOEFL exam allowed the IELTS to dominate Vietnam, says Deren Temel, Manager of International Development at SEAMEO RETRAC in Ho Chi Minh City. In this week’s PIE blog, Temel discusses “the TOEFL exam’s self-inflicted collapse” in Vietnam, and asks readers to lend their insight in the comments. Before we get into the strategic disaster that dethroned the TOEFL exam’s dominant position in Vietnam’s English credentials market, lets set a few things straight. Credentials are certificates, exam scores, or degrees that describe someone’s prior learning and/or skill level. The international recognition of credentials allows students to continue their education across borders. How will English language exams change in the next five years? With online English language courses gaining in popularity, Pat Moores, director and co-founder of UK Education Guide, looks at whether English tests will increasingly be offered online. Specific exams are linked to visa applications, but does that mean provisions cannot change significantly for other purposes? The appetite for learning English shows no signs of slowing up. According to latest figures from the British Council there are over 1 billion people currently learning English worldwide. There is also deepening interest in online delivery of English language courses. For example in May 2015, FutureLearn launched its free course ‘Understanding IELTS: Techniques for English Language tests’. Over 2 million learners have now signed up for the IELTS course across multiple runs. But what is the broader picture? After the Language in London closure, what now? The sudden closure of Language in London, one of the three English language schools until recently that made up Language in Group, shocked the UK’s ELT sector last month. Here Margie Barker, director of Language in Totnes and Language in Group, reflects on the closure and the state of the industry. Recently, yet another London school failed. While all such events are equally sad and distressing, this one hit home even more as it was a school that had belonged to a long term associate of mine. Language in London closed it doors without warning to any of us and staff, students and agents alike were all at once distressed and displaced. Up until quite recently, my own school in Totnes, along with the Dublin school of Kevin Kheffache and Language In London, had been cooperating and pooling our sales and marketing efforts. This was primarily driven by the hope that that by combining our efforts our three smaller schools may be able to compete better with the big players in what is a very competitive and difficult market. We had recently decided to discontinue with this and return to working completely independently because the costs outweighed the benefits and our experimental cooperative simply didn’t work!